The Cappella Paolina (Pauline Chapel) is a chapel in the Apostolic Palace, Vatican City. It is separated from the Sistine Chapel by the Sala Regia. It is not on any of the regular tourist itineraries. Michelangelo’s two frescoes in the Cappella Paolina, The Conversion of Saul and The Crucifixion of St Peter were painted from 1542 to 1549, the height of his fame, but were widely viewed as disappointments and even failures by their contemporary audience. They did not conform to the compositional conventions of the time and the subject-matter is depicted in an unorthodox manner. Despite the importance of the chapel and the significance of their subjects, the frescoes were generally neglected and overlooked in favor of Michelangelo’s nearby masterpieces in the Sistine Chapel.More recently an Italian scholar has recognised Michelangelo's face both in Saint Paul and saint Pete by facial superimposition (Sandro Giometti'Michelangelo, Displaying the Invisible" TAU pub.er Todi 2018).In his last period the Artist felt himself called by Christ as an apostle of his, and expresses this by bestowing his old man's face to the young Saul on his way to Damascus. On the opposite wall he paints his self- portrait in the face of Saint Peter, who stares in a reproachful way at the cardinals and the newly elected pope for their non evangelical lifestyle. The chapel was commissioned in 1538 by the order of Pope Paul III and completed in 1540 under the design and supervision of Antonio da Sangallo the Younger. The Cappella Paolina served as both the Chapel of the Sacrament and the Chapel of the Conclave. Paul III dedicated the chapel to the Feast of the Conversion of St Paul, a festival to which he displayed particular devotion. Given the ceremonial and personal significance of the chapel, it was to be expected that the Pope would require the services of a great artist for its decoration, and, in the opinion of both the Papacy and the people, there was no one greater than Michelangelo. Detail of the Crucifixion of St. Peter by Michelangelo in the Cappella Paolina. S.J. Freedberg notes that the two frescos in the Cappella Paolina, Michelangelo's last paintings, begun in November 1542, almost immediately after the Last Judgement, show from the start a major change in style, away from grace and aesthetic effect to an exclusive concern with illustrating the narrative, with no regard for beauty. Other paintings in the chapel are by Lorenzo Sabbatini and Federico Zuccari. The statues in the background are by P. Bresciano. Before the opening of the conclave the College of Cardinals assembles in this chapel to attend a sermon in which the members are reminded of their obligation quickly to give to the Church her ablest son as ruler and guide. The cardinals then withdraw to the Sistine Chapel. In the Cappella Paolina are sung daily the conclave Solemn Masses "De Spiritu Sancto", at which all members of the conclave must be present. In 1549 and 1550, the Cappella Paolina was used for the papal conclave itself, the Sistine Chapel having been set aside and divided into 19 cells for use by infirm cardinals. The conclave elected Pope Julius III. 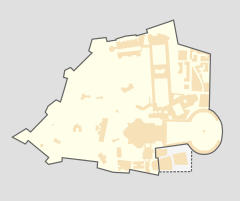 The 1996 document Universi Dominici gregis stipulated the Pauline Chapel as the place where the cardinal-electors were to assemble at the beginning of the conclave prior to the procession and entry into the Sistine Chapel. However, due to restoration work that had begun in 2002, the chapel was unavailable for the 2005 conclave so the Hall of Blessings instead was used for this purpose. The restoration work was finished in 2009 and during the 2013 conclave the cardinal-electors assembled in the Pauline Chapel to begin their procession into the Sistine Chapel. The Pauline Chapel was also the venue where the non-cardinal officials, support staff and other personnel who had duties in the 2013 conclave took their oath of secrecy the day before the conclave. In 2004, the Vatican announced plans to restore the frescoes in Cappella Paolina. Work was completed in 2009, revealing bright colors and hues that had been dulled by centuries of dirt and grime. In 2010, the Vatican website released a virtual reality rendered version of the Cappella Paolina. It presents the chapel in part 3D rendering and part high-resolution photography, unquestionably made after the 2009 restoration. This can be seen at http://www.vatican.va/various/cappelle/paolina_vr/. Two other chapels with the same name are in the church of Santa Maria Maggiore and in the Quirinal Palace, both in Rome. ^ Leo Steinberg, Michelangelo’s Last Paintings: The Conversion of St Paul and the Crucifixion of St. Peter in the Cappella Paolina, Vatican Palace (New York: Oxford University Press, 1975), 17. ^ Leo Steinberg, Michelangelo’s Last Paintings: The Conversion of St. Paul and the Crucifixion of St. Peter in the Cappella Paolina, Vatican Palace (New York: Oxford University Press, 1975), 15-16. ^ D. Redig de Campos, Michelangelo: The Frescoes of the Pauline Chapel in the Vatican (Milan: Art Editions Amilcare Pizzi, 1951), 6. ^ "''Universi Dominici Gregis'' Chapter III Section 50. English text". Vatican.va. Retrieved 13 January 2014. ^ a b "The restoration of the Pauline Chapel". Vatican Museums. Retrieved 29 January 2014. ^ "Notificazione: Ingresso in Conclave (Notice: Entrance into Conclave)" (in Italian). Vatican.va. Retrieved 13 January 2014. ^ Conclave oath of secrecy (Television production) (in Italian). Rome: Catholic News Service. 11 March 2013. Retrieved 2 February 2014. ^ "Notificazione Giuramento degli Officiali e addetti al Conclave (Oath of the Officials and the Employees at the Conclave)" (in Italian). Vatican.va. Retrieved 2 February 2014. This page was last edited on 13 April 2019, at 11:30 (UTC).